At first I thought it would be better to not post anything at all today, simply to honor everyone and everything going on today. But beyond everything else, Father Mychal was one with a mighty impact on me. There he is being brought out of the rubble. 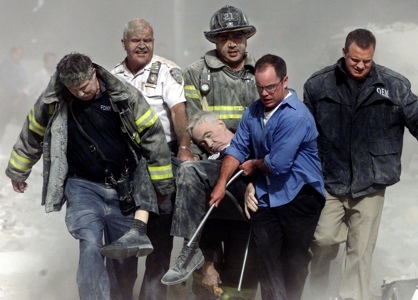 Father Judge, great servant that he is, died because he stayed with his firefighters who had gone into the building. So, to honor this man, this servant priest and gay Catholic, here is Part One of the documentary “Saint of 9/11”. Standard | Posted in National News, sharing	| Tagged 9/11, Father Mychal, heroes, memorials, remembering, Saint of 9/11, US history. Continuing our tribute to Father Mychal, here are more parts of the movie. Standard | Posted in National News, sharing	| Tagged 9/11, fallen heroes, Father Mychal, heroes, Saint of 9/11, US history.